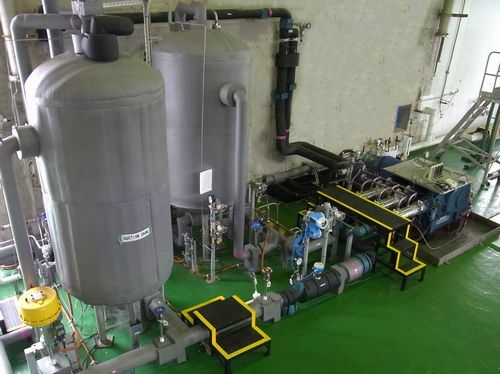 Mitsubishi Heavy Industries Ltd. (MHI), a leading Japanese engineering company, announced on March 6, 2012, that it has developed a high-pressure gas supply unit that uses natural gas as fuel for marine engines. The technology is the first of its kind in Japan. Given the urgent need for energy conservation and climate mitigation efforts in international marine transportation, the unit will contribute to fewer carbon dioxide (CO2) emissions than engines that use conventional heavy fuel oil. The unit supplies high-pressure LNG compressed by a pump to 30 megapascals (approx. 300 atmospheres). The unit is compact in size and operates with less power. Combination with a low-speed two-stroke diesel engine yields a high-efficiency propulsion machine and the use of LNG fuel instead of heavy fuel oil also lowers emissions of SOx (sulfur oxide) and NOx (nitrogen oxide). MHI plans to deliver the first unit to Mitsui Engineering & Shipbuilding Co. in early 2013.